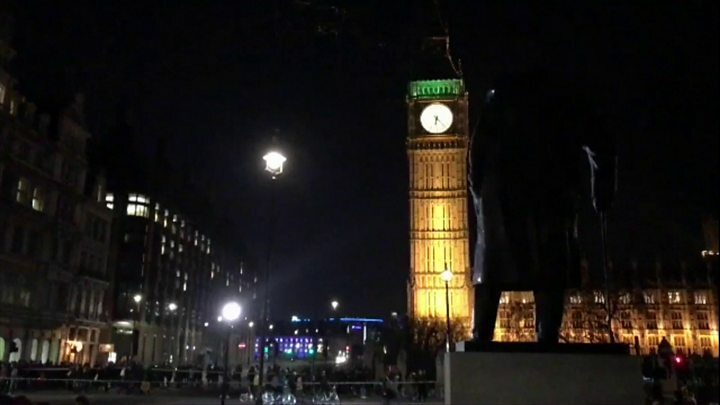 An unexploded 50kg World War Two bomb found in the River Thames has been removed and exploded. The operation by the Royal Navy and Metropolitan Police forced Waterloo Bridge, Westminster Bridge and Victoria Embankment in central London to shut. A Ministry of Defence spokesman said the WW2 device had been towed along the river to Tilbury, Essex, where it was safely detonated. Police had been called to the river at 17:15 GMT on Thursday. 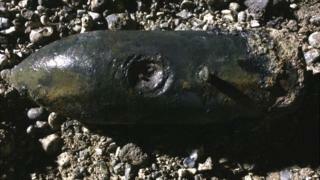 The device has been identified as a German SD 50kg bomb, a small armour-piercing ordnance dropped from an aircraft. The Port of London Authority said the suspected bomb measured 2ft by 1ft (60cm x 30cm). It was identified as a German SD bomb, a small armour-piercing device dropped from an aircraft. Kris Van de Sander, a freelance journalist from Belgium, told the BBC "massive crowds" had spread around Westminster Bridge. He said: "Everyone was a little paranoid." Westminster Tube station was shut but has since reopened, as have the bridges, all surrounding roads and a section of the river between Westminster Bridge and Hungerford Bridge which had been closed overnight. Lieutenant Mike St Pierre, the Royal Navy officer who led the bomb disposal team, said: "It was a long night for me and the team but this is exactly what we are trained for so it was a successful operation, although it was a little surreal carrying out our job right next to the Houses of Parliament." The disruption had threatened to derail Lost In London, a "live cinema" project by Woody Harrelson. The US actor planned to recreate a disastrous night out in the capital with the film broadcast directly into cinemas from location. Some scenes were shot near Waterloo Bridge, but the event went ahead as planned. In November, a shopping centre and homes were evacuated and ferry services halted when a World War Two bomb was found in Portsmouth Harbour. The device was towed out to sea and blown up. An unexploded World War Two bomb was also uncovered by builders near Wembley Stadium in north-west London in 2015. The Army said it posed "a genuine risk to life" but it was removed by a specialist team and safely detonated.